In this tutorial we will discuss how to connect different microphones to take advantage of Duet’s 75db internal mic preamps, We will then go over connecting instruments to Duets 1/4″ Instrument D.I. that was designed to deliver the most transparent sound of your guitars and keyboards. Maestro looks a bit different on the iPad and iPhone, but functions the same in both versions. You will see a Drop down menu under Mic 1. You have four choices… +4, -10, Mic, and Instrument. 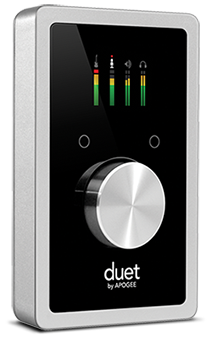 Since we want to use Duet’s mic pre amps… Choose Mic. Mic is actually the default… So if you have never changed it… it should be set to Mic already. Now connect your microphone to Duet’s XLR input with the appropriate cable. If you are using a Dynamic or Ribbon mic simply turn up the gain until you see and hear the appropriate level in your recording app. If you are using a condenser mic, you will also have to turn on Phantom power by clicking on the “48” button. Now turn up the gain until you see and hear the appropriate level in your recording app. If you are using both channels of Duet, you can select group to adjust the gain equally for both channels at the same time… even if they are set to different levels. When using two microphones on the same source… the Phase flip button can come in handy. Sometimes reversing the polarity of one mic may result in a fuller sound. If you are connecting a guitar, bass or keyboard directly to Duet, you will want to connect to the 1/4″ input that is in the center of the XLR connector. Now change the menu in Maestro’s input page to “Instrument” and adjust the level so that you see and hear the appropriate level in your recording app.